Larry Welsh | Acupuncture | Boulder, CO | functional infertility, whole food nutrition, preventing miscarriage, enhancing fertility in men and women, health, stress reduction, stomach ulcer, inflammation, anxiety, dysglycemia, diabetes, losing weight. Larry Welsh M.Ac., M.A. practices non-insertional, gentle acupuncture, moxibustion, healing with whole foods, and Chinese and Western herbal medicine for recovering health. An accomplished teacher in the field of optimal nutrition, he guides patients to achieve their ideal weight, blood sugar, sleep, and energy levels. 40 years of expertise in stress reduction and relaxation skills to help people achieve optimal health. Larry works with his patients to transform themselves, their lives, and their health. He specializes in Functional Infertility for men and women, Healthy Pregnancy, Women’s Menopausal challenges, Fatigue, Allergies, stress, Chronic and Acute Pain, Digestive Disharmonies & Microbiome Health, recovery of Respiratory Health, Heart Health, Kidney & Bladder Health, Uterine Health, Liver & Gallbladder Health, Stomach Health, Immune System Health, colds, and flus. His patient testimonials speak for themselves. What does this medicine have to offer? 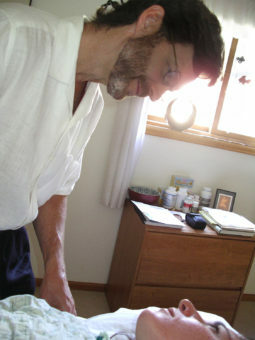 Larry Welsh has been a licensed acupuncturist in the State of Colorado since 1993. He holds Masters and Bachelors degrees in Classical Five Element Acupuncture. He has practiced Chinese Herbal Medicine since 1996. He has trained in nutritional whole food therapies through Standard Process nutritional study group since 2001. He is a senior teacher of healing with whole foods for Standard Process West. Senior acupuncturist 1999-2012 for Lutheran Medical Center’s “Bridges Integrative Healthcare Clinic” in Wheat Ridge, now solely in private practice. Senior adjunct professor teaching Yang Style Short Form of Taijiquan at Naropa University and privately. He holds Masters and Bachelors degrees in Buddhist and Western Psychology. Mindfulness Meditation Instructor since 1981.